I bought a comfy knit skirt this summer that I LOVE. It is comfy and has awesome pockets and I want to wear the heck out of it. We all know what this means, right? I had to recreate it! I took some pics for a tutorial just in case you want to make one too. And this would totally translate to a kids skirt, too…I should make one for Sadie sometime! 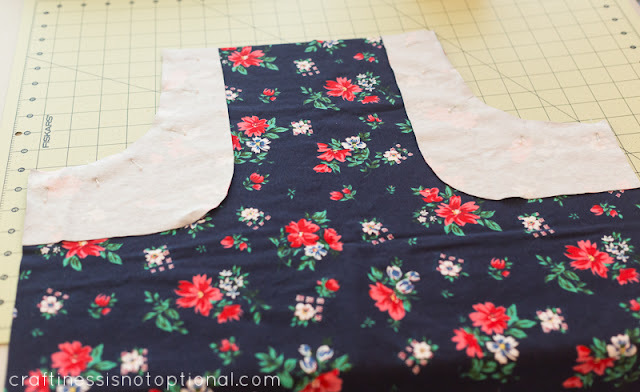 Fabric is from Girl Charlee, though I don’t see this print in stock anymore. I also made a quick pocket pattern if you don’t feel comfortable making your own or are lazy. cough *enabler * cough. 1-1.5 yards of interlock or jersey knit. I’d recommend interlock over jersey though 🙂 It’s sturdier. 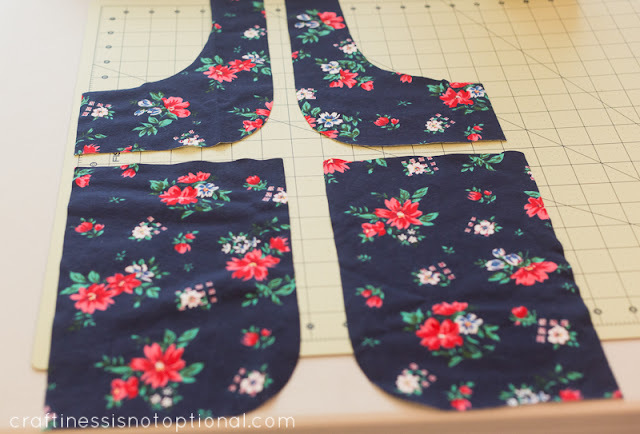 So first off, measure around your waist where you want the skirt to sit. Add 4″ to that measurement, and divide it in half. That will be the width of your skirt panels. Then decide how long you want the skirt to be. 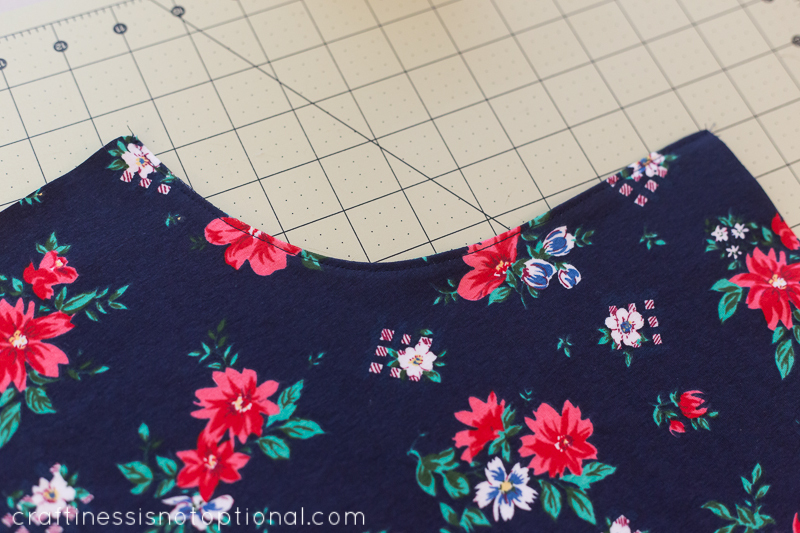 Add 1.5″ to the top for the elastic, and length for a hem. You can always shorten it if it’s too long! Next cut two panels from your fabric using the width and length you figured out. Line up a piece of paper with the corner of the top of one skirt panel like so. 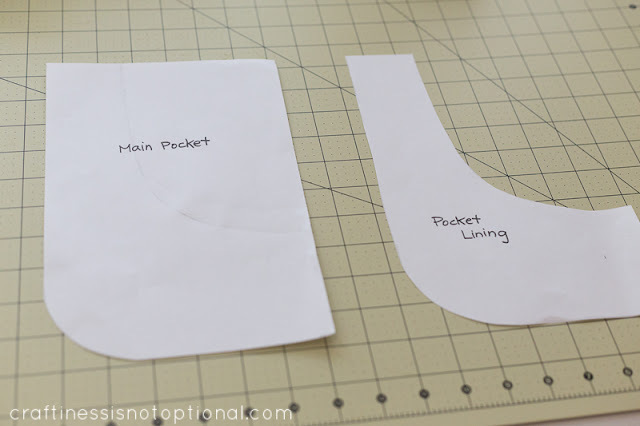 Create a curved pocket like so, and also curve the bottom of the pocket pattern. You can make them as deep or shallow as you like. Make a copy of this pattern and cut the curved part off of one of the patterns and label accordingly! Next cut out two of the pocket lining, and two of the main pocket. Make sure to cut the pieces right sides facing. 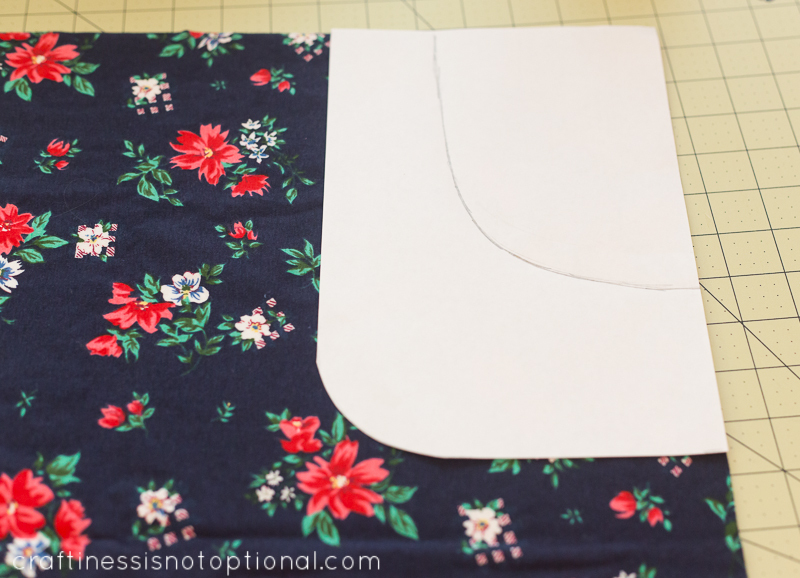 Then on the pattern, cut on the curved pocket line you created and then line it up with the top of one of the skirt panels, lining up the pattern with the top and side of the skirt like so. Cut along the curve. Repeat for the other side. 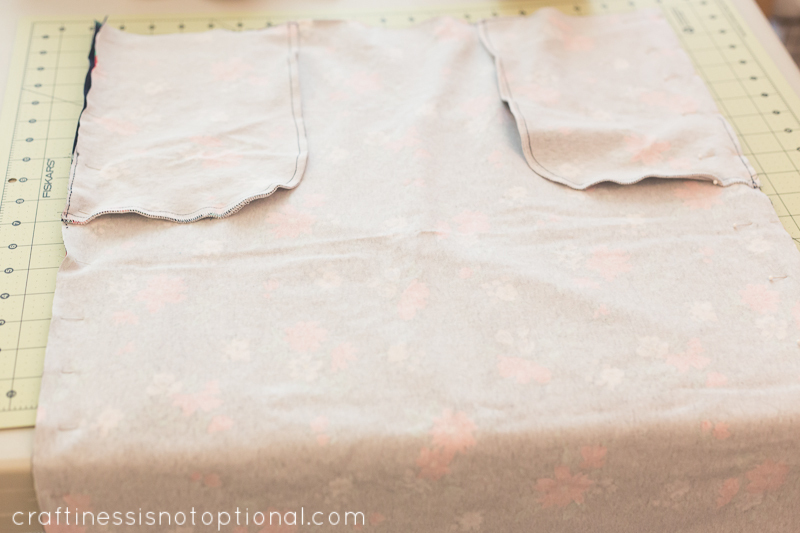 Then pin the pocket lining to the skirt piece, right sides together, along the curve. 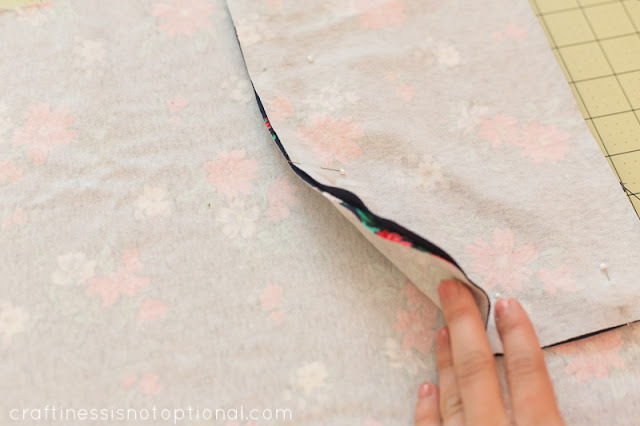 Then flip so wrong sides are together, press along the seam, and top stitch 1/8″ from the edge. Repeat for other pocket. Then lay your skirt piece right side down, then take one of your main pocket pieces and place on top of the pocket lining like so. Pin around the curve. 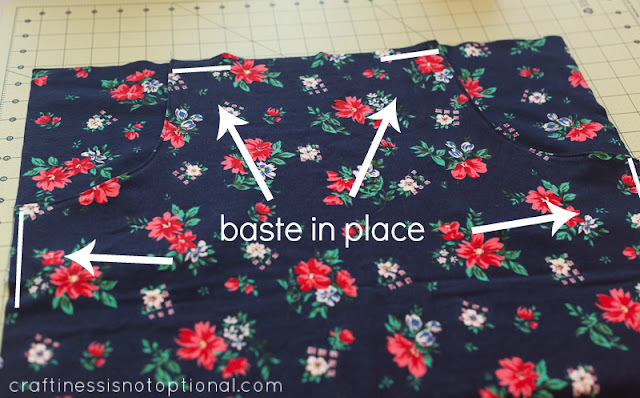 Make sure not to catch the skirt in your pinning. 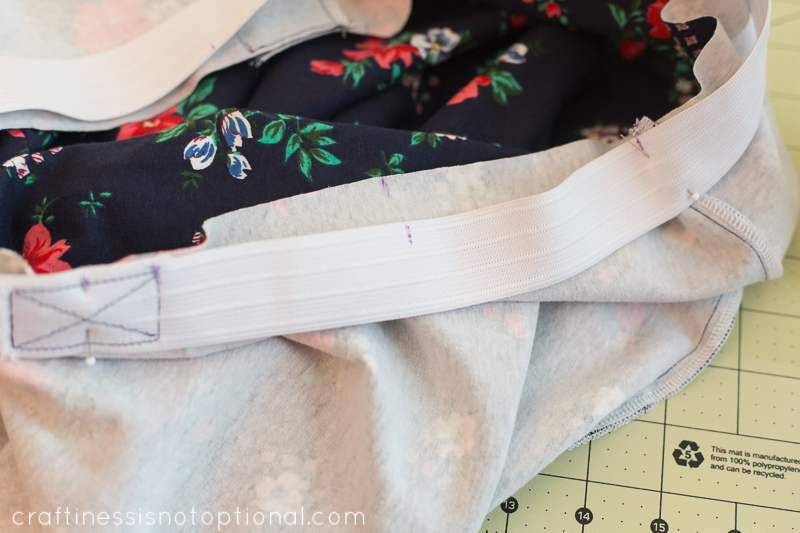 (or sewing) Sew along the curve. Repeat for other pocket. 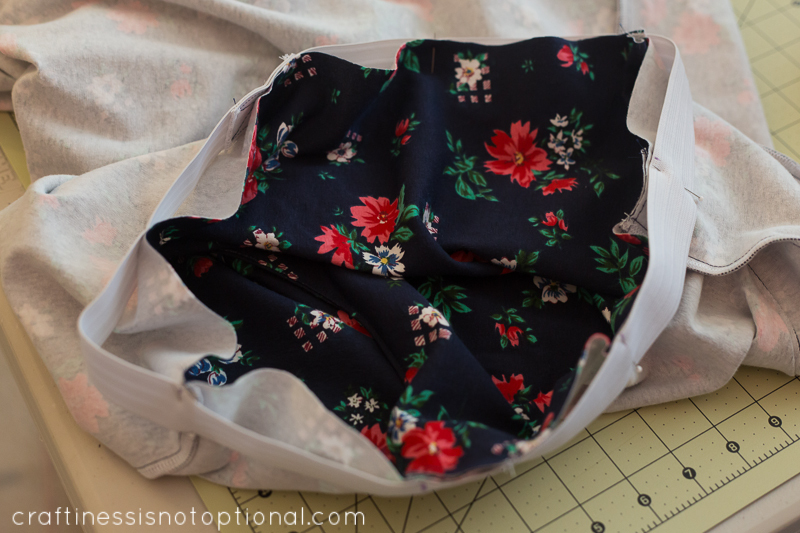 Then pin and sew the sides of the skirt, right sides together. Then fold elastic in half and make marks (either use a pin or a disappearing marker) at both ends. Do the same thing with the other ends, and then make marks in between each 4 of these marks. You will have 8 marks all together. This will help you evenly distribute the elastic when sewing it to the skirt. 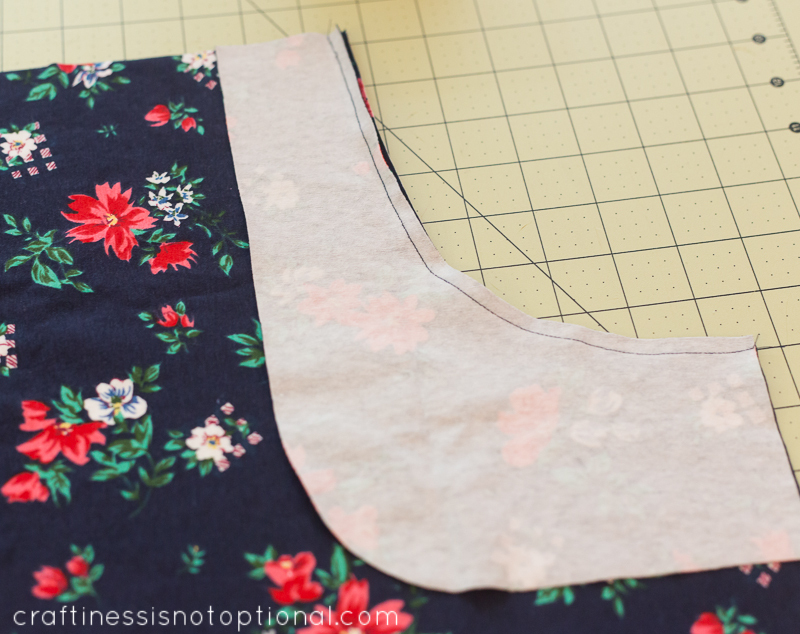 Do the same thing to the skirt, using the side seams as a starting point. Next match and pin the marks to each other like so. 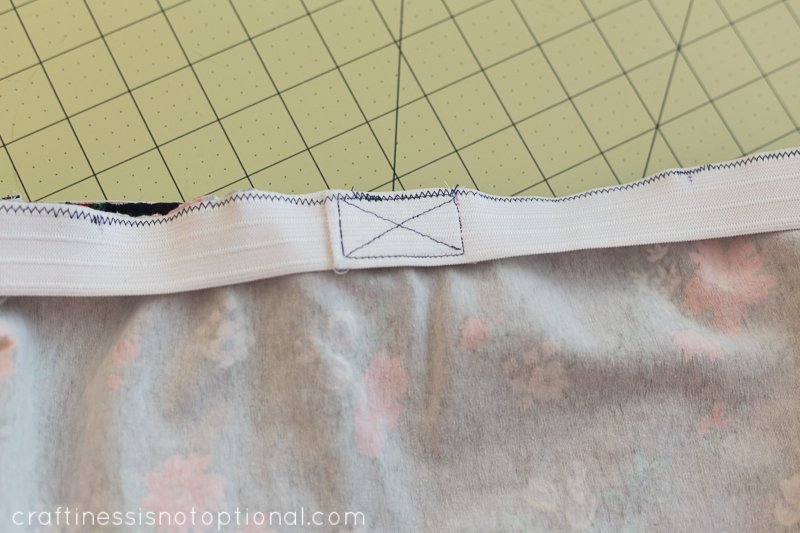 Make sure to pin the elastic to the wrong side of the skirt top, and match up the raw edge with the edge of the elastic. 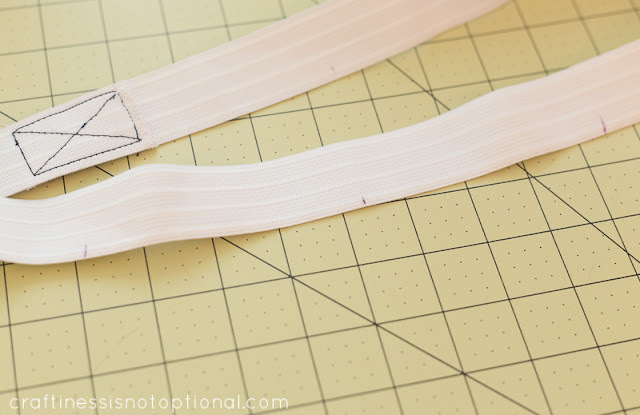 Next using a zig zag stitch, sew along the edge of the elastic and fabric, pulling the elastic tight while you go. 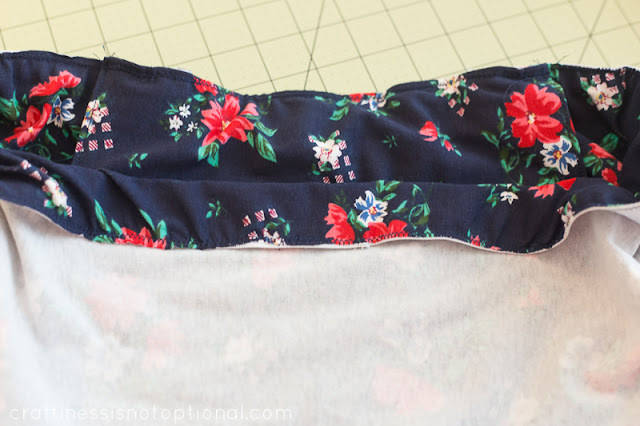 Next flip over the top of the skirt like so, and sew with a straight stitch along the bottom of the elastic, pulling the skirt and elastic as you go to prevent puckering. 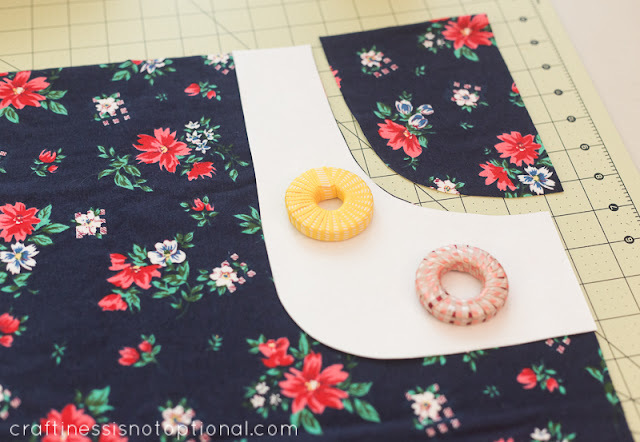 Hem the bottom of the skirt to your preferred length, with a double needle, (tips for a double needle here) and you’re done! This looks like a nice, simple skirt. I’m tempted to try, even though I haven’t got experience working with knits. 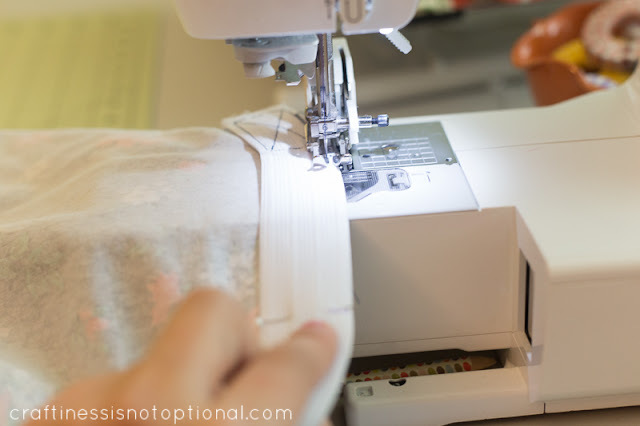 Have you seen this method of making the skirt waistband. I think it would look great on your skirt pattern. What a super cute skirt! 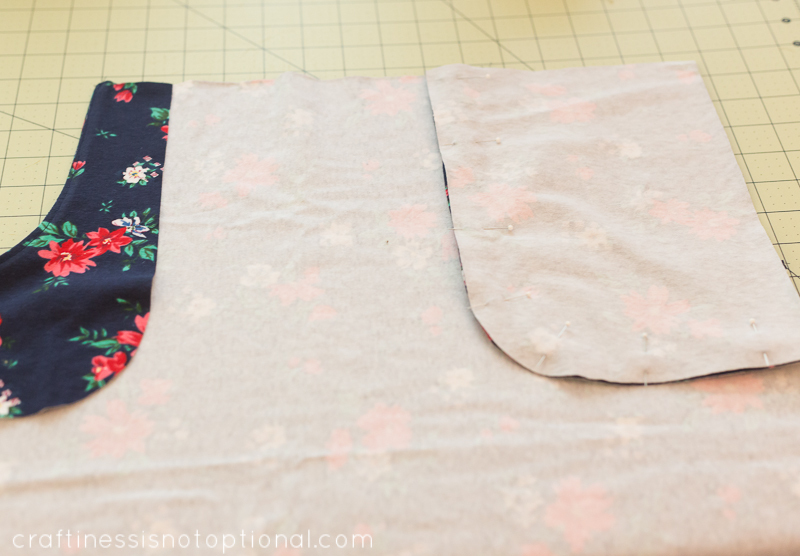 I LOVE that floral print fabric! 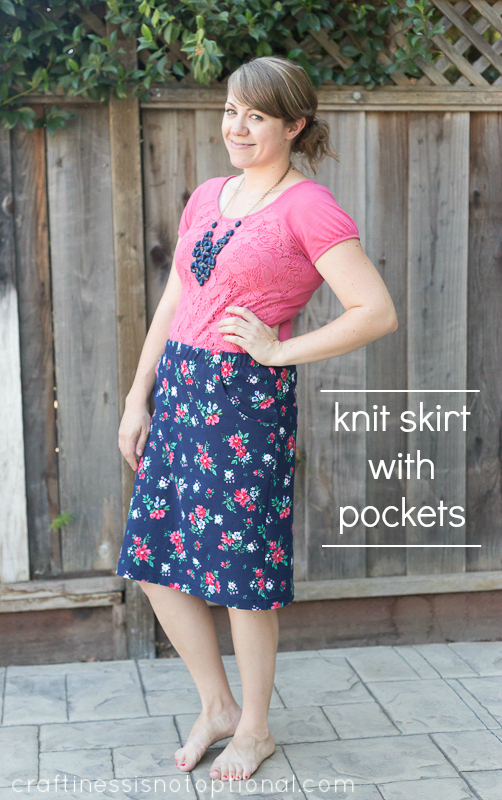 Lovely skirt – pinning this to my ever-growing list of future dressmaking projects! This looks like a great skirt. I really should sew something for myself one of these days! Super cute! Thanks for sharing another awesome tutorial! Ruby-awesome! lol…great minds do think alike! Great tutorial! I am a complete newbie but i was able to foliow the instructions just fine and add pockets to my first ever skirt! 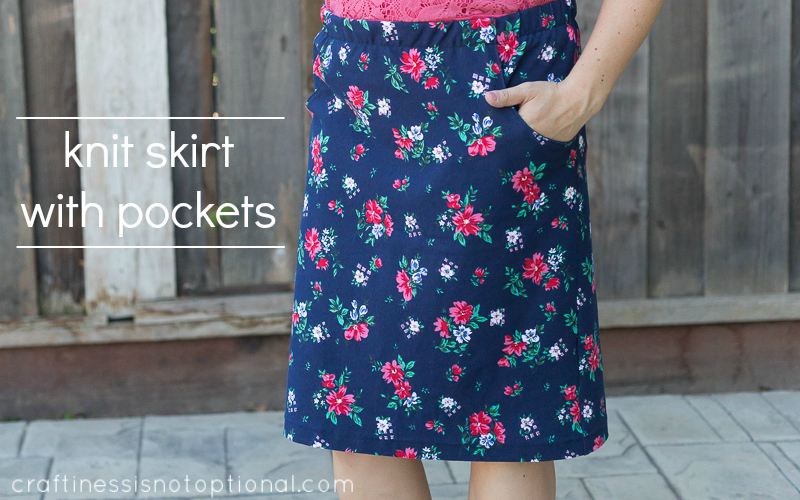 Do you have any tutorials on drafting a pencil skirt?